We’ll be releasing a new version of BestMARC on Wednesday October 31, at 11:30am. The newest feature we’re announcing is custom My Records Columns. In your Profile, you’ll be able to set up to 5 columns to display any MARC subfields of your choosing. 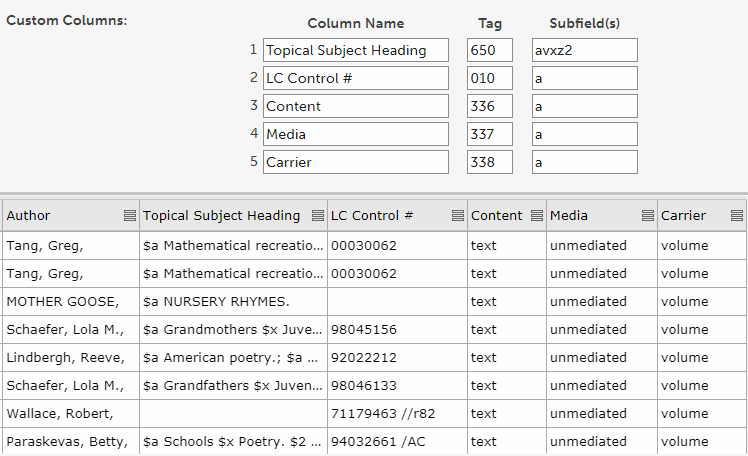 So if you’d like to display columns for Content, Media, and Carrier then you can do that. Or set it up to show subject headings, reading programs, summaries, award notes, or whatever else you’re interested in looking at. Custom columns work like any other column, so you can sort on them or filter them based on a search term. This feature gives you more flexibility than ever before to view your MARC database the way you want. Added feature to show up to 5 custom columns in My Records by setting them in the Profile. Records must be reloaded to see any changes made (see next item). The release may take us up to 90 minutes, so if you try to log in during this time, you may experience problems. Just try to log in again later.